Hi Robyn. I looove shaker cards (can't do them though, they always leak lol). This one makes me feel like I'm inside a boat an looking out a porthole. A great atmosphere and a great design. Hi Dot. This is Donna and you "got it right" ... looking out a port hole. I was hoping for that idea! Thanks for your comments. LOL! 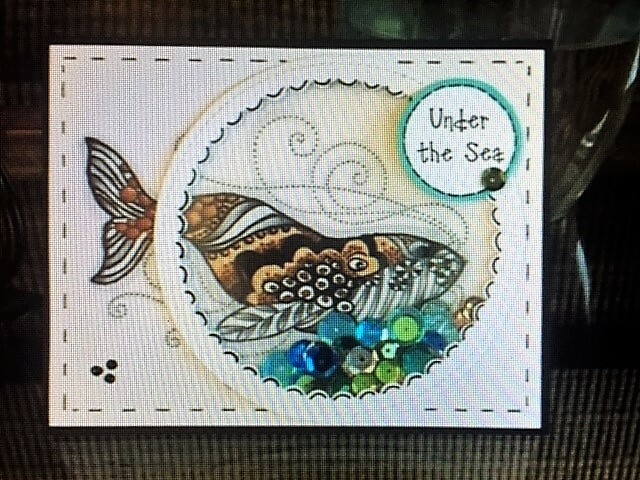 I can't usually do a shaker card either so I'm rather impressed with yours Donna;) I love how the whale seems to swim into the ring. Thank you so much Robyn. You and Dot both got it right ... that's exactly what I was hoping. I love shaker cards and do them often. I hope I inspire others to give it a try! Thank you. Thank you so much Teresa! After seeing what others had done with this image, I was a bit intimidated so your positive comments are much appreciated! 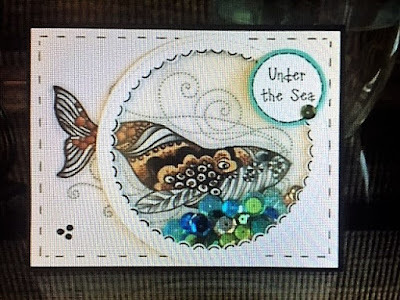 LOVE how you have coloured your whale, LOVE how you have placed the pretty shaker too - WOW - such a WONDERFUL design, reminding me that my nephew is crusing the high seas, and quite likely to be seeing sights just like this! LOVE the whale, the black background is a perfect touch. the shaker is a great idea. the swirls/flourishes are a lovely touch too :) Thanks for the share. Oh thank you Ms. Wolfe! :-) And thank you for taking the time to leave a comment. I so appreciate that.